An easy recipe for Loaded Smashed Red Potatoes - an incredible crowd pleasing appetizer or easy side dish. 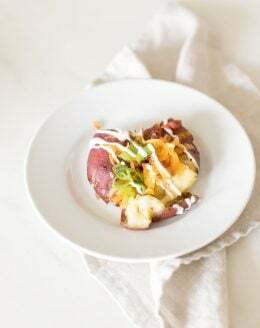 Smashed Red Potatoes are boiled, smashed, and baked with olive oil, cheese and bacon until crisp and topped with sour cream and chives for an irresistible and memorable appetizer! Bring a large pot of water to a boil over medium high heat adding salt. Boil potatoes until tender, about 12-15 minutes. Place potatoes on a baking sheet. Using a potato masher or back of a wooden spoon, gently press to smash. Drizzle with olive oil, fresh cracked salt and pepper. Top with shredded cheese and bacon pieces. Bake 15 minute or until crisp. Top with sour cream and green onions. Fresh shredded mild cheddar is best. To drizzle, thin sour cream with heavy cream, half and half or milk and funnel into a ketchup or mustard bottle and cover in a zigzag pattern.